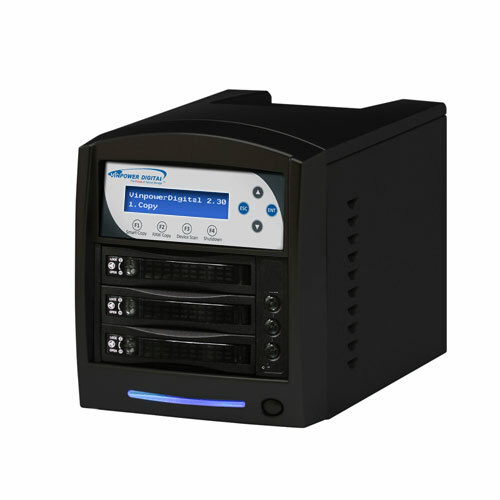 The Vinpower Digital standalone HDDShark Turbo hard drive duplicator is the perfect solution for those that need to make back-up or residual clones of the master hard drive (HDD) content. Available in multiple size configurations supporting reading and writing speeds up to a blazing fast speed of 150MB/sec, allows the user to make quick and reliable clones of nearly any HDD using virtually any OS platforms, such as Unix, Linux, Windows, or Macintosh . The HDDShark Turbo supports the FAT16/32, extFAT, NTFS, and ext2/3/4 file systems. Using the HDDShark Turbo gives you a piece of mind that each HDD will be copied accurately and quickly for a no hassle, low cost alternative to performing this task 1 at a time through a PC. Additionally, The HDDShark Turbo performs the reliable Quick Erase and/or Full Erase option, but if can also erase the HDD up to the high government DoD 5220 standards which ensure there was no trace of the content left behind. *The actual reading/writing speed may vary depends on actual HDD device. W 7" x D 12" x H 8.5"
W 10 1/2" x D 15" x H 11 1/2"
W 16" x D 13" x H 12"
W 7.5" x D 13.5" x H 12"
W 12" x D 17" x H 17"
W 19" x D 19" x H 15"
W 7.5" x D 21" x H 15"
W 12" x D 25" x H 20"
W 16" x D 29" x H 27"
Supports HDD sizes 3TB +: The HDDShark can accurately copy very high capacity HDDs, including 3TB and larger, for long term archival storage or large capacity data files.